The imbalance of hormones and poor habit of skin care can be a significant risk factor of developing acne. In fact, the problem is much more common in teens, the time when the puberty is going on. However, there are lots of simple things that can help ease the problem, preventing it from getting worse or spreading on your face. Understanding the way of how acne occurs! 3 key points of why you can get acne are the excess oil production, dead skin cells, and plugged skin pores. Acne can occur when the small hole of where hair follicle grows is plugged, typically with dead skin cells and excess sebum oil. 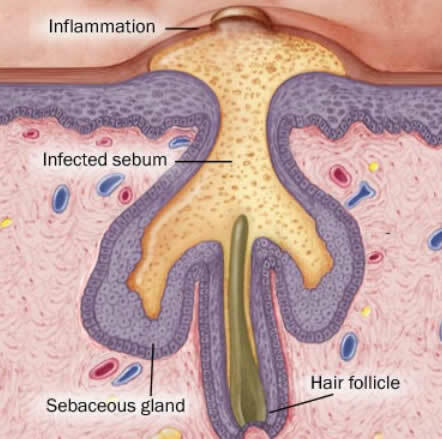 There is a chance for this plugged hole to get infection (such as by bacteria), making the acne worsen. Since the quantities of sebum production can vary throughout the body, there are some prone areas where acne is more likely to occur. Typically, these areas are easier to have excess sebum because they have the most sebaceous (oil) glands. These include face (the most prone to acne), back, chest, neck, and shoulders. 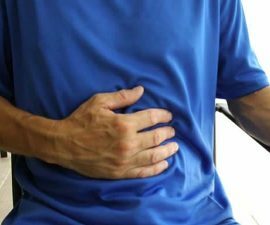 Unfortunately, the problem can be persistent – though some effective treatments are available. Many times, it heals slowly and even may cause scarring. And when one goes away, others may crop up. 3 Top acne myths you need to know! Some foods are thought can worsen or trigger the problem – is this true? In fact, diet has a very little effect in causing acne. However, your diet and what you eat can affect your entire health, including your skin. But remember that the occurrence of acne is complex, and your diet is only one of many factors. It’s not bad idea to restrict certain foods that you do believe can trigger your skin allergy or may worsen your pimples – especially foods that also can be bad for your overall health, such as fatty foods. But you should not rely on the diet alone! The fact, the use of cosmetics don’t necessarily make the acne worsen, particularly if you choose to use oil-free products that will not cause clogged pores – and always wash and clean your face before going to bed to remove the makeup regularly! 3# Acne and dirty skin; is there a link? Actually, dirty skin is not directly linked to the chance to develop acne. However, it’s also important to regularly clean your wash.
Too frequently washing the skin. Too hard scrubbing the skin. Cleansing the skin with harsh soaps. How your good skin-care should go? Just wash and clean your skin & face about 2-3 times a day. But don’t do it too over! For instance, twice a day wash your face with a mild, gentle soap and lukewarm water. And use both of your hands when washing – avoid using other tools (such as sponge or washcloth) that usually can irritate your skin, your fingers and palms are always the safest choice!